This is "Bug report content" page in EurekaLog project's options. Bug report content page specifies information to include into bug report. You can enable/disable information blocks here. See this article for more information about bug reports. 1. "Store this information in the bug report" (.soXYZ) option controls gathering of information in general section of bug report. These are generic information pieces, which mostly describes run-time environment. Only section two ("Exception") is specific to the problem. You command EurekaLog to gather and include into report piece of information by checking checkbox on the left from this information name. Most options can be enabled and disabled, but there are few options, which are required and can't be disabled. These options are marked with "(*)". "Select all" and "Unselect all" buttons can be used to quickly set/clear full selection. Warning: your application may be considered as harmful (spy-ware) by customers, if it collects extensive information which is definitely non needed (like monitor information for non-GUI applications). 2. "Save modules list" (.loSaveModulesSection) option includes information about all loaded DLLs and BPLs ("modules") into bug report. Note: this option is automatically disabled for reporting leaks. 3. 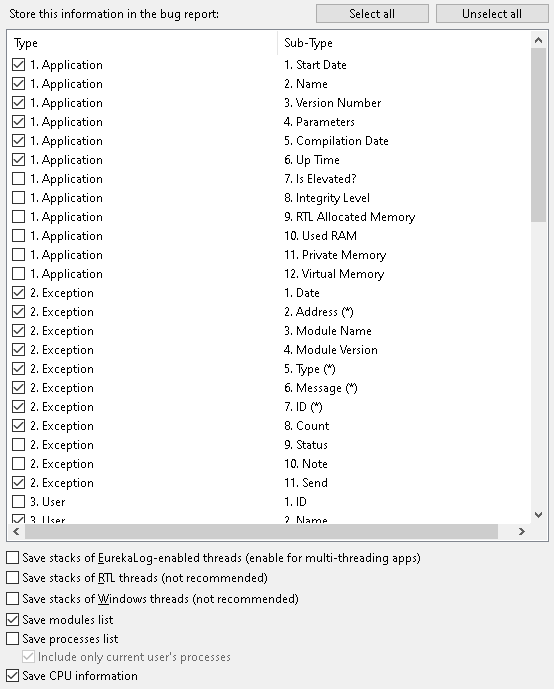 "Save processes list" (.loSaveProcessesSection) option includes information about all running processes into bug report. 4. "Save CPU information" (.loSaveAssemblerAndCPUSections) option includes information about CPU state (flags, registers, etc) and disassembly information in bug report. This option requires installed low-level hook.